Discussion continues on how to overhaul high school graduation requirements to better prepare students for workforce and college. A 2017 state law calls for rethinking different ways students can prove they are ready to graduate instead of the traditional end-of-course exams required to earn a diploma. The committee needs to address skill and preparation gap students face between graduation and career or college, says committee chairman and state board member, Byron Ernest. One concern is that 50 percent of students graduating with a general diploma require some type of remediation when they reach college, according to state data. Twenty percent of those earning a Core 40 diploma need remediation. The panel – made up of educators, lawmakers, and representatives of industry and higher education – is charged with considering how to include college entrance exams, such as the ACT or SAT, U.S. military, placement exam and industry-approved certificates. One suggestion includes allowing students to satisfy graduation requirements by completing an internship or earning an industry certificate. But Michigantown principal Allen Remaly, and others who made public comments Tuesday, warned the panel those types of state mandates won’t benefit students in all communities. Remaly says he’s attempted to partner with local mechanical and manufacturing businesses but is told, that training students receive in school wouldn’t be much of a factor to hiring them. Others were critical of making internships a graduation requirement since some rural areas already struggle to find those opportunities for students. 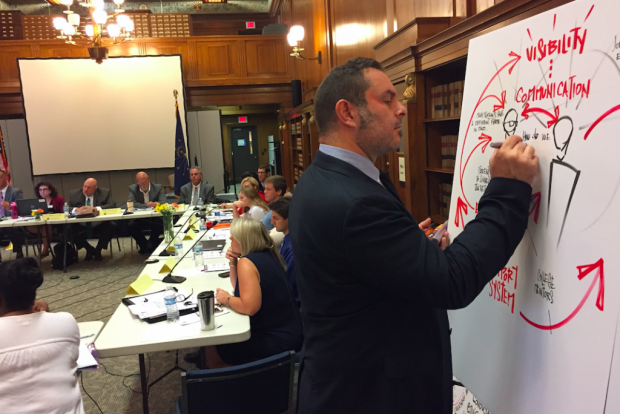 School leader and representatives of Indiana principals and superintendents asked for flexibility in the final recommendation, so local school boards could better tailor requirements to students. But state Rep. Tim Brown (R-Crawfordsville) later said too much flexibility would come at a cost to taxpayers. Students and parents were invited to provide their ideas and experiences to the committee. Some spoke about the negative view students have toward vocational programs and the students who take part in those trainings. The 14-member committee is expected to provide final recommendations to the board later this year. There are seven more meetings scheduled through Nov. 17. The next meeting is 9 a.m. Aug. 29 at the Indiana State Library, History Reference Room 211.